A new museum devoted to 20th and 21st century art and design, opening its doors to the public next month, aims to become an extension of the Atomium, described by its creators as the monument's "10th sphere". 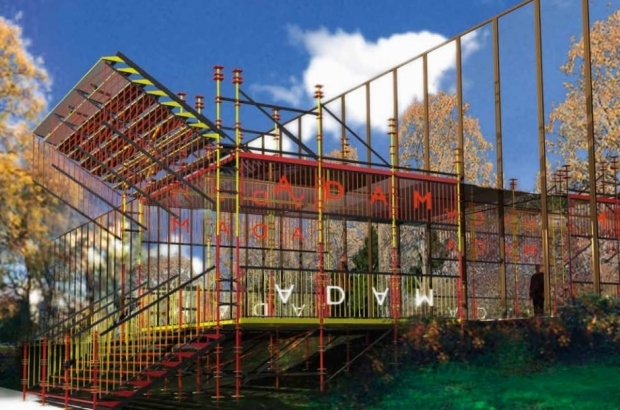 Just 100 metres away from the Brussels landmark, ADAM, the Art and Design Atomium Museum, will offer a much larger and more flexible exhibition area than what is currently available inside the Atomium, with 5,000m² of space. "It's so close to the Atomium so it was an obvious choice," says Atomium spokeswoman Inge Van Eycken. "The aim is to have the art and design exhibitions here because we have more space. It's easier to have exhibitions here - it's more accessible than the rooms in the Atomium." The museum is located in a little-known John Portman-designed building which houses Trade Mart Brussels - a low, sober construction, set back from the other public areas on the Heysel Plateau. To give the museum visibility, architect Jean Nouvel has designed a large sign that will beckon visitors, who will walk through it to the utilitarian metal staircase that he has transformed with bright colours and a vertical repetition of the staircase to create a mirror image awning. Since the Trade Mart is sheathed in reflective glass it will enhance the visibility even more by presenting multiple virtual images of the enlarged staircase. Taking centre-stage will be a permanent exhibition, the Plasticarium, bringing together more than 2,000 plastic items from collector Philippe Decelle, ranging from everyday objects to designer pieces, from the golden age of plastic in the early 1960s up to 2000, via pop art. The first item from the collection that visitors will see on entering the museum is the Universale No.4860 chair by Joe Colombo - one of the most iconic pieces of plastic design and also the first piece that Decelle collected. He found it on the street, saving it from the scrap heap, and this serendipitous action was the spark that led to the creation of this unique collection. "He wanted to keep it [the collection] in Belgium and he wanted to keep it together," says Van Eycken. "He didn't want to have one thing sold to a collector in Germany, and another one in America." The 1,500m² permanent exhibition space cannot display the whole collection - described as the only one of its kind in the world - so it will be rotated annually. The museum will also host temporary exhibitions from next March, including the Artview contemporary art show from April-June and an exhibition as part of Bozar's Summer of Photography from late June to the end of August. The minimalist museum environment was designed by Lhoas & Lhoas Architects. The biggest challenge they faced? "Time," says co-founder Pierre Lhoas. "Time and money." However he is confident everything will be ready for 11 December, the museum's grand opening. "Another challenge was how to make this collection look like something coherent for the public. The structure of the exhibition was very important," Lhoas adds. The team behind the ADAM project hope that 125,000 people will buy a combined Atomium-ADAM ticket in 2016. As well as the exhibitions, a series of lectures on art and design is planned, and guided tours will be available in English, Dutch, French, German, Spanish and Italian. Opens 11 December, every day except Tuesdays, 10.00-18.00. Adults €10, under-18s/students/seniors €8, free under six.